First of all the Dropbox article does make a lot of sense functionally. Each of the tools they suggest contain functional requirements for any startup and most businesses as well. So, understand that my criticism isn’t of the functionality requirements. Email – Missing from Dropbox’s list is email. Love it or hate it, email is the centre of the communication workers world right now. Even if we have better internal tools we still need to communicate with our partners, vendors and customers, and email does this. Note: for small mailing lists exchange email can be used for email newsletters but you will need Mailchimp or an alternative at some point once that list gets over say 100 recipients. Mailchimp – I agree with Dropbox this application is critical for managing mail lists. Fortunately the entire team doesnt need access to it, probably only a couple of key people. Skype for Business – Instant Messaging, Video conferencing, Webinars, Presence, Unified Comms. You name it – this tool is invaluable for any team to communicate together. This replaces Slack – which also has an aggressive pricing model – if you want access to your archives after 10,000 messages you have to buy in. Skype for business is free inside Office 365, has integrated presence and IM history stored in Exchange. Planner – the Microsoft Planning hub is a fantastic light team based project management system that is comparatively similar to Trello, free inside Office 365, and has security tied in. IT connects seamlessly with your data and Email – Trello doesn’t do either of these. If you need a heavier solution Microsoft Project isn’t free but available inside Office 365 and does the heavy lifting for project management. SharePoint and One Drive for Business. Free inside office 365 SharePoint makes Dropbox look childlike. All the same basic functionality of storing files, version control and syncing to local machines are there. However SharePoint contains team tools like workflow, Delve, content meta-data tags and tight integration with the whole Office 365 suite. Security and authentication are the same so no extra logins required. The power of SharePoint may not be obvious to the causal user but there is far more capability for extensibility. Accounting. I wont specify a specific accounting tool here, though there are some reasons i don’t prefer Xero as a cloud accounting application. Price and price of plugins is one reason. Financials for Office 365 is one option. Others include MYOB and QuickBooks Online. Ensuring your system has hooks out (APIs) for data analysis with tools like Excel, PowerBi or PowerPivot will make your accountant happy (Quickbooks Online does for instance). CRM. 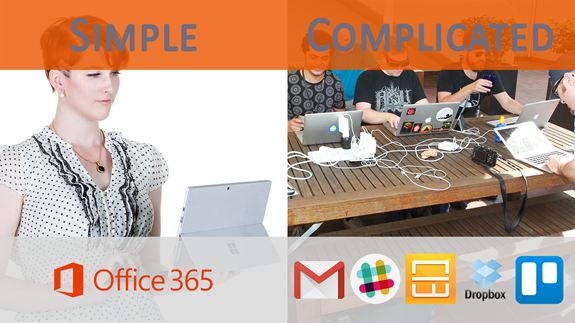 Microsoft Dynamics CRM can be integrated with Office 365 and can include the same credentials. Website – Squarespace or WordPress are good starting points for a cheap and easy to create and manage site. Drupal is a much better option for long term scalability and growth. LinkedIn Solutions – i’m going to leave this one here for the same reasons Dropbox suggest it. PowerBi – Data analysis – for everything. From Google analytics data to accounting data to CRM data to just about anything else you can think of. The only separate items are accounting, Mailchimp and LinkedIn, each of which your entire organisation doesn’t need access to anyway.